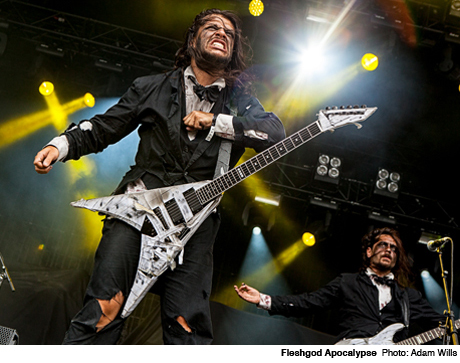 Scheduled among the early performers of day two, Italy's Fleshgod Apocalypse had at most a half hour to win over the crowd, and time constraints were tightened even more by the fact that things were already running behind. As technical death metallers Origin were wrapping up, Fleshgod Apocalypse were still finishing their sound check dressed in their own band hoodies. But in moments they left the stage to quickly return in tattered tuxes, making a more impressive entrance in keeping with their bombastic extreme metal sound. A muddy outdoor fest isn't the ideal environment for symphonic orchestrations and operatic supporting vocals, especially after 40 straight minutes of death metal. But windmilling in sync, their blast beats vibrating intensely, Fleshgod Apocalypse's performance was a solid blend of skill, aggression and style.